UB’s pioneer student Navigators are immersing themselves in their new roles as consultant-advocates to help Baltimore’s underserved tenants. Below they describe some of what they are learning and experiencing in the first semester of the program. As a bailiff in the District Court I was often assigned to tenant and escrow court. I saw enough cases to know that the way the system operates isn’t easy to figure out, for tenants or for landlords. I thought being a Navigator would be a good opportunity to learn while giving tenants encouragement and direction. The program seems to be working really well. The court personnel, some of them my former co-workers, seem to appreciate our presence and what we’re trying to do. We’re not only helping the tenants but in many cases, also helping the system to run more smoothly. Jim Amos is a former military reservist and retired police officer. Most recently he served as a bailiff in the Baltimore District Court for six years. Amos is a senior majoring in jurisprudence and plans to go on to obtain his law degree. One thing I’ve noticed from being in the courtroom is that there are lots of inconsistencies in the system. Some judges are more impatient or detail-oriented or friendlier than others. It can be very frustrating for people to come back for a follow-up hearing with certain expectations and have a completely different judge. One of our roles, I think, is to take note of these inconsistencies, point them out and help people through them. Another valuable thing we can do is to listen and learn what has brought tenants here. Hearing their stories can make you view things differently, especially because most of us have never been in anything like the situations that they are facing. Tenants are sometimes portrayed as people who just don’t want to pay rent. But the conditions they’re dealing with are often very bad and there are things that really need to be changed. Wendy Brehm is a senior jurisprudence major. Her future plans include attending law school to become a civil rights lawyer and disability rights advocate. It’s been really cool to be a part of the program as it’s developing. In the beginning everything was new—even though our training helped us be familiar with the court processes, none of us knew what to expect. But pretty quickly the judges seemed to notice we were a presence in the courtroom. Often while you’re listening to cases you hear about something you think you might be able to help with. Already we’ve become more comfortable approaching people, telling them about the program and offering assistance. Having a Navigator as a resource can change the whole court experience for tenants. Often they need to provide information quickly and just filling out some of the court forms can be pretty complicated. And if someone misses a deadline, they can lose their opportunity for rent abatement or another ruling that could help them. Frank Phillips is a UB senior majoring in jurisprudence. I was drawn to this program because it’s a way to be actively involved in making a positive change for Baltimore City. A couple of things have been particularly surprising. The first is how confusing the courthouse is. From the time you walk into the building it’s difficult to figure out where to go. And then once you’re in the courtroom, things move at such a rapid pace—a tenant may have five minutes to present a case. There is little sense of support or help for people in difficult circumstances. Often you see the same landlords or their attorneys appear over and over. Sometimes they have 20 cases filed against them in one day, so they are used to appearing before a judge and have established relationships. Tenants go in at a disadvantage; it’s almost impossible for them to be prepared and present their cases in the most effective way. Sometimes just listening to people without criticizing or blaming them is enough. I’ve had tenants in tears just because someone cared enough to hear their story—it’s very powerful. I hope the Navigator program can become sustainable and even expand to other types of cases eventually. It is critical and desperately needed. Shannon Thomas, a senior majoring in jurisprudence, is the President of the Philosophy Club at UB. A mother of four, Thomas will enter law school in the fall of 2018. In my most fulfilling case so far, the tenant had filed an affirmative escrow (which means she had started the litigation process, instead of the landlord initiating it) due to inspectors finding 54 violations in her home inspection. Before court she informed me that her landlord had sent her a notice to leave her rental in 60 days, which is illegal once escrow is filed. As a result, the tenant signed a new lease and began to move. Today, she didn't have escrow money for her landlord because of signing the new lease. Having spoken with her, I knew she just wanted to get out of the lease. In court I heard the landlord’s agent reiterate his desire to take possession. The tenant’s nephew was with her for support, and I asked him to ask the agent if he would be willing to talk to the tenant before filing to evict her for failure to pay rent. I saw it as an opportunity to educate the tenant on the process to get what she ultimately wanted. I explained to her that she could try and resolve the issue. Well, she did. The agent and the tenant made arrangements to hand over the key at a later date, giving them both what they wanted. At the end, she asked if she could give me a hug. If I were trying to prepare someone to be a Navigator I would say, be ready to embrace the situations we see and learn about the people. Often they lead you down a path that will not only make their lives better, but make your life better too. Maurice Whitehurst has worked in technical editing and production in fields including broadcast journalism and higher education for more than 15 years. Now a junior majoring in jurisprudence, he plans to focus his legal career in a field that effects social reform. Watch a video about the Navigator Pilot Program available on UB's YouTube channel. 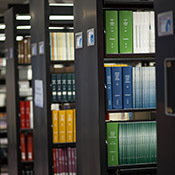 Learn more about the evolution of the library's archival material. Take a look inside "Pretty Mobile Baltimore"